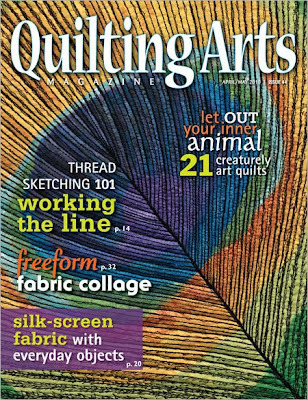 My art is on the cover of the next issue of Quilting Arts magazine! I made this peacock feather piece called “Vanity” to demonstrate how you can use thread to highlight the element of line in your work. It’s featured in the second installment of my thread-sketching series, which will run through 2010. You can pre-order the April/May 2010 issue of Quilting Arts right now by clicking here. It will be going out to subscribers in the next few weeks, and on newsstands (including Barnes & Noble) soon after that. At a posted request from Lark Books, I volunteered to do book reviews. This little 144 page book arrived along with 500 Art Quilts in my mail last week. Books are second only to chocolate in my list of things to love, so the opportunity to get free books to review was met with eagerness. 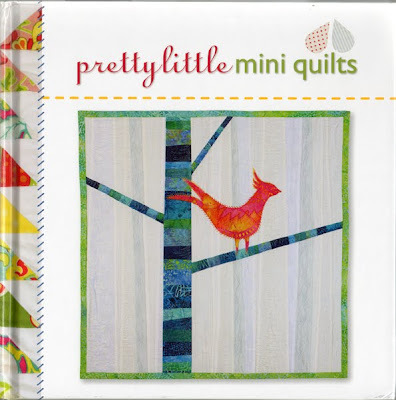 Pretty Little Mini Quilts, by Ray Hemachandra, is an enjoyable and easy read that feels good in the hand and is refreshing to read. It is well designed to intrigue the beginner to want to learn about quilting and to tackle a project. There are 31 different projects that range from fairly traditional to very artsy. None of the projects require extensive knowledge or equipment to do. All are designed to be accomplished with minimal time and monetary investments - a boon in this economy. No quilt is larger than 36 inches. Breezily written to inspire, it is not a detailed "how to" book. An experienced sewer will recognize missing details that may cause a problem for a beginner. I could easily see a quilting grandmother using this book to introduce a grandchild to quilting. Another good use for the book would be a beginners' quilting class at a fabric shop. The projects are tempting and feel very doable. In summary, this little book can help increase the numbers of new quilters, especially younger ones. It will not answer all the questions, but may help at least get a younger generation trying to find out some of the questions about quilting. And goodness knows, we do need to help the next generation discover the wonderful world of quilting! !